Ahead of a return to North Korea to visit dictator pal Kim Jong Un, NBA Hall of Famer Dennis Rodman stopped to thank a cryptocurrency built around legalized weed for making it all possible. Potcoin, which bills itself as “banking for the cannabis industry,” gushed that Rodman is ”in the very rare position to be able to claim longtime friendship with both the Supreme Leader of North Korea, as well as with the current president of the United States,” according to a press release. The digital currency was launched in early 2014 in an effort to provide the legal cannabis industry, which was being shunned by banks, with a secure way to make and receive payments. Rodman, whose connections with President Donald Trump stretch back to his appearance on two seasons of “Celebrity Apprentice,” said the details of his trip would be revealed upon his return. While it’s unclear what the cybercurrency might be doing with Rodman in North Korea, past suggestions that the country is a “pothead paradise” are simply untrue, according to the Cannabist. In short, a country that metes out such strict punishment for foreigners merely removing a political banner would likely deal pretty harshly with someone buying or smoking marijuana. But PotCoin didn’t say what the trip has to to do with a bitcoin-like digital currency aimed at transactions between legal marijuana users and merchants. 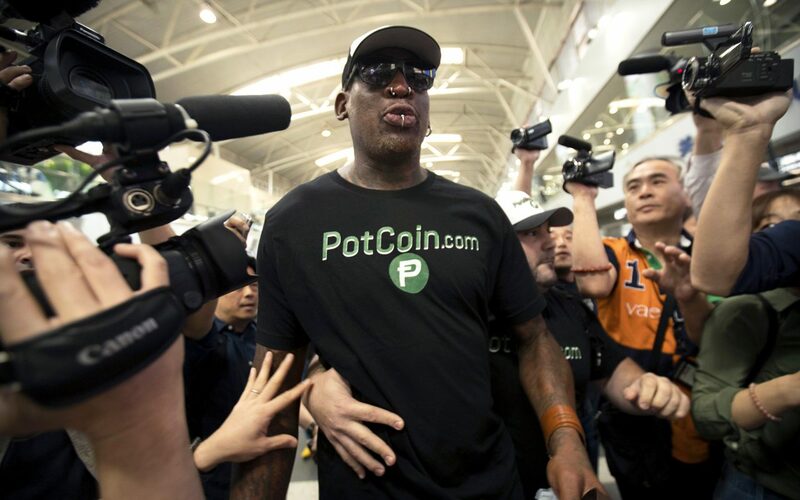 The company’s statement quoted Rodman as saying that “the folks at PotCoin … realized the importance of this trip and made it all possible for me.” The flamboyant Hall of Famer wore a t-shirt emblazoned with the PotCoin logo during his flight to Pyongyang. The current market cap for potcoin, which acts as a digital currency and an alternative payment network for cannabis users, merchants and industry professionals, is $33.39 million, according to the website. Like bitcoin BTCUSD, +0.31% and other cryptocurrencies, potcoin has seen a spike in prices in recent months, with the price rising from a value of a penny in March to the current price of just over 15 cents, or 0.00005740 bitcoin. Out of some 876 cybercurrencies listed on the Coin Market Cap website, potcoin ranks No. 66 when it comes to market cap.